Barefoot with Champagne: Sprucing Up! In preparation for Dave's Big Birthday Bash next weekend, we've been sprucing up the backyard/deck. 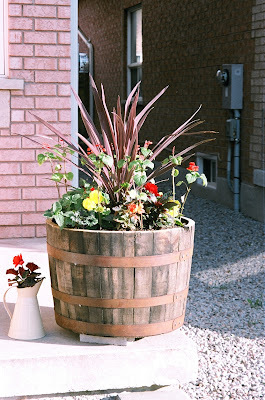 I of course started with flowers, I'd fallen in love with these wine barrel planters I saw all over Napa and San Fran then I remembered seeing them at TJ Maxx and was SO happy they were still there weeks later when I finally pulled the trigger! I also got the cute little candle lantern at TJ for a whopping $6! Not to toot my own horn, but I like mine better! Hell yeah! Self-High-Five! Anyways, we also painted the garage, the same color it was before... but now it doesn't look as ghetto. I also added a few flowers and a Pink Hibiscus to the front porch planter! I LOVE Hibiscus flowers! I was so happy when this baby was only $7 at Lowes! Sold! 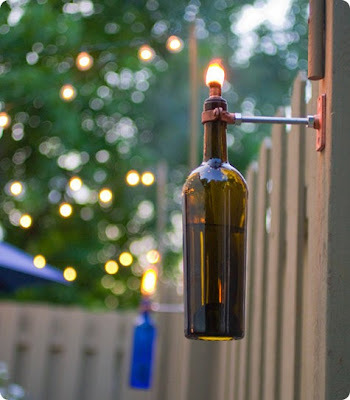 And we're working on this little diy to add more light to the backyard. I'll show finished pics when they're all hung up, I'm working on drinking 2 more bottles so we can have enough... it's a rough life I live. Lol! I am in love with that cool lighting idea! The plants look great, Tine! And Tex makes those wine bottle planters. He might have some helpful tips! Miss ya, friend. Love that lighting idea so much! Drinking wine? That's the kind of home improvement I can get behind! 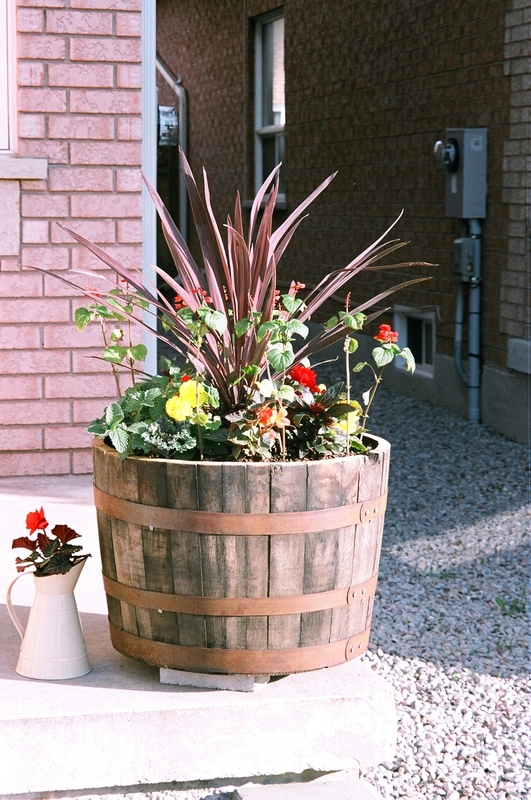 Love your planters! I can't wait to see your finished project... looks so neat! Can't wait for the Par-tay! Got someone to cover my shift so be expectin me!